The workshop covered aspects of using a blade as a self-defense tool. I would like to express foremost my appreciation to Sensei Alun Williams and his Total Body Defense Instructors (whom all are incredible martial artists in their own rights) for their openness to accept and invite me to instruct a workshop for them. 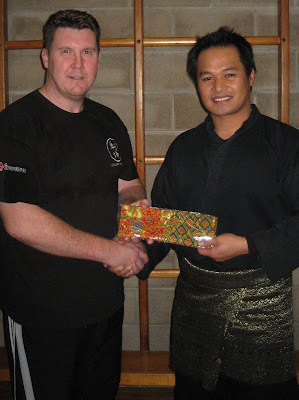 To Charles Rawlins for his friendship and enthusiast in Silat, and Rhys Evans for taking the pictures for the event. Instructors Rob Pascoe, Carl Grant and Marco Guy for being my receivers. My apologies if I miss anyone. The seminar started around 8pm and finished at 10pm. The workshop started off with a small introduction from Alun Willams and myself. Then the instructions started with familiarizing the participants with the angles of incoming attacks. As everyone knows, if a knife is brought into a fight, the result can only be permanent injury or the death to one or both parties that are involved. The instruction presented covers the aspects of utilizing a blade in a more positive light, using it as a self defense tool rather than a killing implement. Instructions covers on how to use a blade in a self defense situation without causing permanent injury or death to the attacker. The drills taught targets on the attacking limbs and low risk body parts (far from the arteries or internal organs) to stop the attacker from being a threat at the same time using the blade in a justified manner as to not seriously injure the attacker. 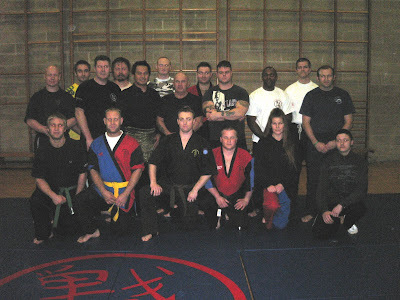 The participants were taught to defend and counter from multiple slashes and stabs rather than a singular knife attack. In essence, a single counter from the defender is enough to stop any knife attack. But for the benefit of training, the attack and counter movements are drilled in a flowing sequence with the attacks coming from different directions continuously and the defender counters every movement with a non-lethal knife assisted offense of his/her own. Because this type of drill requires the defender to feed of the attackers energy, if done correctly, it will accelerate the installment of correct body mechanics and attitudes in dealings with a knife attack. The reason for this is to give the participants the understanding that a knife doesn't have to be a killing tool, it can be used responsibly in self defense under correct and competent instructions and training. The last 15 minutes I demonstrated machete (sword) works with the help of Sensei Marco Guy. And explained the principles and strategies that are associated with the blade in general. As a gesture of cultural exchange and friendship a gift of "Kain Batik" was presented to Sensei Alun William at the end of the event. Feedbacks from the participants were very encouraging, more wanted to know the Bruneian Martial Arts. A public seminar will be organized in February 2008. So if you are interested watch this space. Please enjoy pictures from the event at the image links.